Please welcome Bob Proehl to The Qwillery as part of the 2016 Debut Author Challenge Interviews. 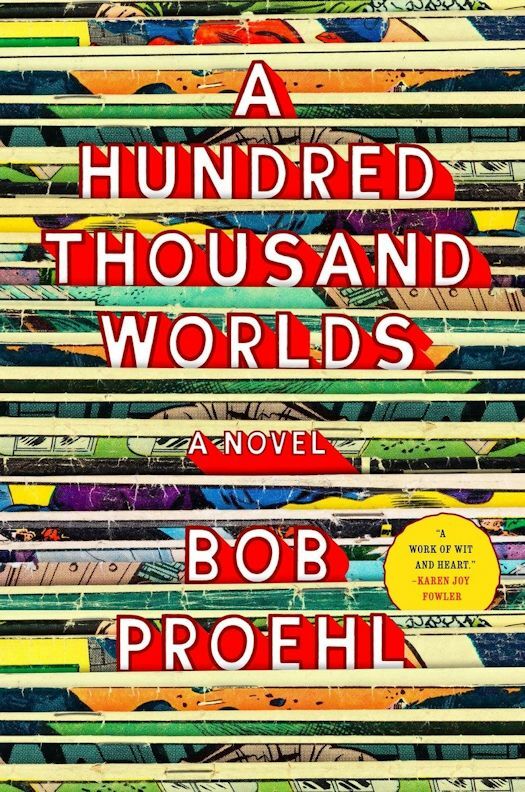 A Hundred Thousand Worlds was published on June 28th by Viking. I outline now, because I am a grown up, more or less. Those outlines end up getting tweaked heavily or abandoned as the book tells me where it wants to go. I have a natural tendency to sprawl if I don’t have at least some kind of plan. I’d end up writing 700 page books where the characters just have lovely emotional moments and nothing really happens. Which I’d be thrilled with and no one would ever read. Bob: Right now, it’s making time for it. We have a one-year old, and given my druthers I would spend every waking hour with her and never get any writing done. Once I sit down at the desk, staying locked in and focused is the hardest part. Shutting off the internet, leaving the phone in the next room. I write in my garage, so the only major distractions are squirrels and the occasional bird fly-in. Willing yourself to be selfish about it is hard. Bob: That’s a hard question to answer, because the most correct answer is that you bring everything to the desk with you when you sit down to write. For me at the moment, parenting and step-parenting are what I keep coming back to. Those are the things that keep snaking their way into my writing, along with the idea of the family you have vs. the family you choose for yourself. TQ: Describe A Hundred Thousand Worlds in 140 characters or less. Bob: The story of a mother and son, traveling cross-country visiting comic-cons, towards the revelation of a secret she's been keeping from him. TQ: Tell us something about A Hundred Thousand Worlds that is not found in the book description. Bob: All the comic book stuff, the cons, the fandom, they’re just backdrop. They’re the stage on which this story of a mother and her son plays out. It’s not a book that asks you to bring a lot of knowledge about these subcultures along with you. There are plenty of easter eggs in here for hard-core fans, but it’s a story that’s accessible to anyone. TQ: What inspired you to write A Hundred Thousand Worlds? How many Cons have you attended and do you have one that stands out for you? Bob: There was a moment a couple years ago where I was heading to New York City Comic Con for the first time. You have to get off at Times Square and hike about a mile north to the convention center, which is also where BookExpo used to be. So I’d been to the convention center a bunch of times for work. But this time, as I got closer and closer to the convention center, the crowd got geekier and geekier. It was like someone was sifting New Yorkers and letting all the “norms” fall through. By the time I got to the convention center, it was this little world of people who had at least one thing in common with me, this enthusiasm for some kind of weird stories. I remember thinking right then that this was a world I wanted to write about. Of course, that’s just setting. The story grew out of my experiences as a stepparent to a (then) eight year old. Seeing the way he interacted with stories, these two ideas clicked together and I had the start of the book. I’ve been to a handful at this point, and each one has something great about it. I love seeing how the concept of a convention gets interpreted differently in different cities. As I’m writing this, I’m getting ready to go to Houston for a convention, and I’m really excited to see what a Texan comic book convention looks like. TQ: What sort of research did you do for A Hundred Thousand Worlds? Bob: I went to conventions and chatted up writers and artists. I have a friend who was working at DC, and I’d fact check stuff with him every now and then. I read a couple books on the history of the comic book industry; Sean Howe’s Marvel Comics: The Untold Story was both a lot of fun to read and a lot of help generating ideas. It’s great to write about something so close to your own interests, because you can basically claim stuff you’re already doing as research. Lying on the couch reading X-Men comics? Research. Going to see the new Avengers movie? Write that ticket off, that’s some research. Bob: Gail Pope was the easiest to write. She was supposed to be a bit part, she was only going to show up in one scene (see above re: best laid plans). But I kept having these scenes in my head and thinking, “Gee, you know Gail would be fun in that scene.” All of the sudden she was one of the point of view characters. Weirdly enough, Brett was the toughest character to write. Writing this book in my early thirties, I had real problems empathizing with someone who was kind of an alternate universe version of myself in my mid-twenties. He had the least at stake, which I suppose is true of a lot of dudes in their mid-twenties. I had real problems finding his voice. At some point, I sat and thought about how a comic book penciller might think about the world, what the act of seeing would be like for him. I got this idea that he would think in panels, in singular moments and images. I started writing him with really short sentences, no progressive verbs, hardly any conjunctions. Once I had a style and voice for him, he really opened up, but it took a long time to get there. TQ: Why have you chosen to include or not chosen to include social issues in A Hundred Thousand Worlds? Bob: I know in the larger scope of things, the politics of fandom are pretty small, but you fight from where you stand. A lot of fan culture is in this big moment of change right now, and there are battles being fought over what these subcultures are going to look like. That’s what #GamerGate and the Sad Puppies/Rabid Puppies nonsense in sci-fi is about. They’re about staking a claim on what it means to be a geek, or a fan. There are these gatekeeping movements going on, and I have zero patience for it. There are no gates, it’s just sad dudes standing out front being petulant. And hateful, and occasionally violent. So with this book, I tried to paint a very real picture of fan culture, but it’s the fan culture I want to see. It’s me staking a claim on what fandom means, which is something big and inclusive, with creators and fans of every possible stripe telling new stories, building new worlds. TQ: Which question about A Hundred Thousand Worlds do you wish someone would ask? Ask it and answer it! Bob: “Hey, would you like to write actual comics about some of the made-up comic book characters in the book?” The answer would be a resounding yes. 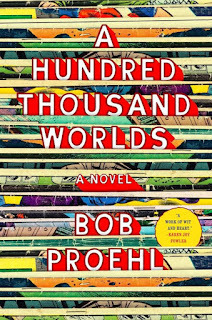 TQ: Give us one or two of your favorite non-spoilery quotes from A Hundred Thousand Worlds. Bob: Well, for the next couple weeks, everything is about this book. I’m doing a bit of touring, and I’m going to San Diego Comic-Con to sell some books. But after that, I’m finishing up the next book, which is completely different. It’s historical fiction. It’s set in Russian-occupied Warsaw at the end of the 19th century. It features a young Marie Curie. It’s been incredibly tough to work on, very research intensive, but I’m coming to the end of it and I’m really happy with how it’s come together. Bob: Thanks for having me! BOB PROEHL grew up in Buffalo, New York, where his local comics shop was Queen City Bookstore. 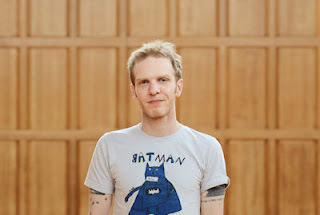 He has worked as a bookseller and programming director for Buffalo Street Books, a DJ, a record store owner, and a bartender. He has written for the 33⅓ book series and worked as a columnist and reviewer for the arts and culture site PopMatters.com. Proehl currently lives in Ithaca, New York with his wife, stepson, and daughter. Check out Bob's Upcoming Events here.